[San Francisco, October 7, 2015] Julieta Yang, a Filipina migrant worker employed as a live-in domestic worker filed a complaint today in the San Francisco Superior Court against her former employers, tech executives Cameron Poetzscher and Varsha Rao. The complaint alleges that Poetzcher and Rao failed to pay Ms. Yang the required minimum wage and overtime for all hours worked and failed to provide the required off-duty breaks. The complaint also alleges that Poetzcher and Rao created and maintained a sexually hostile work and home environment and failed to prevent harassment in violation of the Fair Employment and Housing Act. 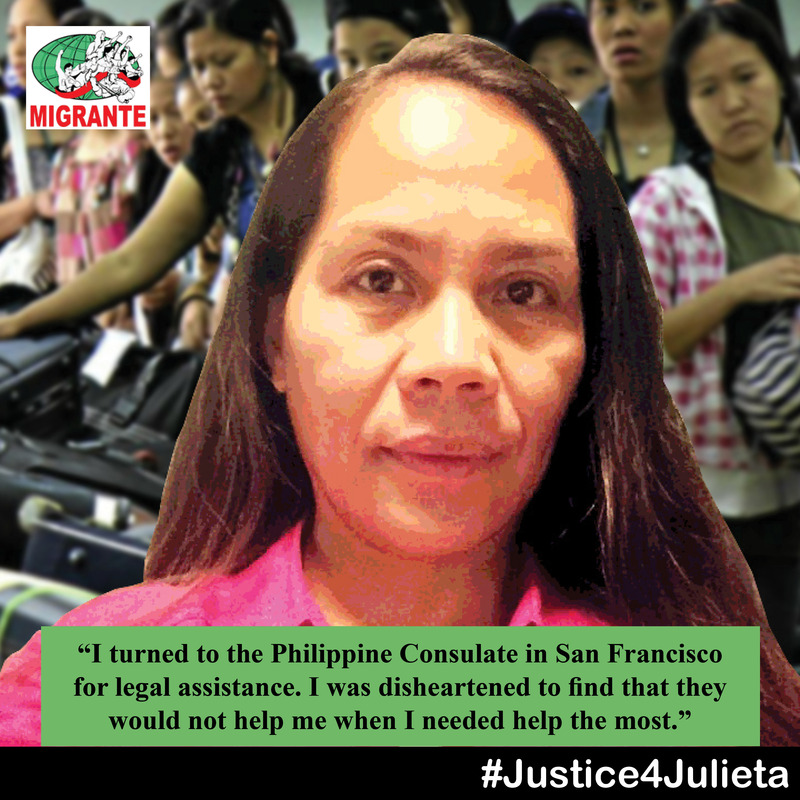 Princess Bustos, an organizer from Migrante said, “Julieta is like many other Filipina migrant workers who, due to the lack of jobs in the Philippines and in order to support their children, are forced to work abroad, often under abusive conditions. Migrant workers are left alone to navigate new environments and cultures without protection and services from the Philippine government or any knowledge of their rights as workers,” said Bustos. More than 6,000 Filipinos leave the Philippines every day in search of a livelihood abroad. In 2014, migrant workers remitted $24.3 billion back to the Philippines and its economy. Despite this, the Philippine government fails to allocate sufficient funds or provide much needed legal and basic services to assure the protection of Filipino migrant workers. A majority of the migrant workers who leave the Philippines are women, many of whom end up employed as domestic workers. According to American Community Survey (ACS 2004-2009), 46% of an estimated 2.5 million domestic workers in the United States are foreign-born. In a 2013 California report issued by the National Domestic Workers Alliance, 61% of domestic workers surveyed were paid an hourly wage at their primary job that was below the level needed to adequately support a family (using a conservative measure of income adequacy). 25% of the domestic workers reported that they were paid below the California minimum wage. Sexual harassment of domestic workers is also a problem. Worker advocates believe that the sexual harassment of domestic workers remains severely underreported. “Domestic workers, who work alone and behind closed doors, are particularly vulnerable to sexual harassment, low pay, and other unfavorable working conditions,” stated Hina Shah, Director of the Women’s Employment Rights Clinic at Golden Gate University School of Law, and one of the attorneys for Ms. Yang. “Despite the vulnerabilities, migrant and domestic workers are standing up and organizing. They are collectively educating the larger community about their experiences, taking action against abusive employers, and pushing for greater workplace protections. They deserve to be treated with dignity and respect,” said Bustos. Migrante Northern California is an alliance of Filipino migrant workers groups and organizing committees in the Bay Area that advocate for the rights and welfares of Filipinos overseas and their families. They educate and organize the community around local issues such as wage theft, discrimination, and trafficking and link these to larger systemic issues and movement building for real social change in the Philippines. Migrante Northern California is the lead organizer of the “Justice for Julieta” campaign. The mission of Asian Americans Advancing Justice – Asian Law Caucus is to promote, advance, and represent the legal and civil rights of Asian and Pacific Islander communities. Recognizing that social, economic, political and racial inequalities continue to exist in the United States, the Asian Law Caucus is committed to the pursuit of equality and justice for all sectors of our society with a specific focus directed toward addressing the needs of low-income, immigrant, and underserved APIs. The Women’s Employment Rights Clinic (WERC) is a clinical law program at Golden Gate University School of Law. Over the past 20 years, WERC has partnered with community based organizations, advocating for the rights of low-wage and immigrant workers through direct service, impact litigation and public policy work. WERC served as legal counsel to the California Domestic Workers Coalition, which helped pass AB 241 in 2013, extending overtime to approximately 80,000 domestic workers in California. The California Domestic Workers Coalition led the passage of the Domestic Worker Bill of Rights in 2013. It is a coalition of grassroots domestic worker organizations and community supporters that work together to uphold the dignity of domestic work in our homes and ensure that statewide laws and agencies defend domestic workers from abuse. National Domestic Workers Alliance et al., Home Truths: Domestic Workers in California 6 (2013) at http://www.datacenter.org/wp-content/uploads/HomeTruths.pdf.